Retirees love to travel. In fact, many workers spend their entire professional lives anticipating the dream vacations they'll take in their golden years. After all, to travel the world, you need time, something retirees have in abundance. But jet-setting can be an expensive hobby. Of course, with the right budgeting and financial management help from a financial advisor, you can still travel widely without depleting your retirement savings. In addition, being based in the right place can make travel cheaper and easier as you set off to far-flung locales in your post-work life. So below, we looked at data on access to travel, affordability and other metrics to rank the best cities for retirees who want to globe-trot. In order to rank the best cities for traveling seniors, we looked at data on 11 metrics. We examined the number of international flights, the number of domestic flights, senior income tax rate, property crime rate, housing costs, real estate tax, travel agencies per 1,000 establishments, the number of international destinations, housing costs as a percent of senior income, senior poverty rate and the average cost of domestic flights. Check out our data and methodology below to see where we got our data and how we put it together to create our final rankings. Texas tops - Texas has a nice mix of affordability, major airports and low tax rates, which make for enticing cities for retirees who love to travel. 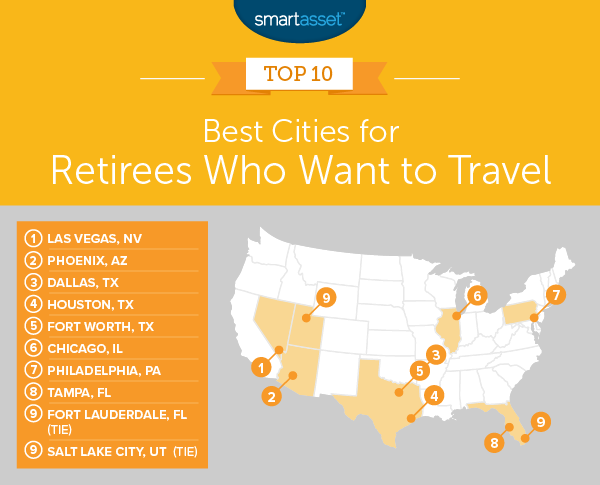 In total, Texas cities took three of the top 10 cities for seniors with wanderlust. Florida cities are another good option - The proximity of Florida cities to other countries makes it easy for residents in Florida to travel internationally. Combine that with affordable homes, low taxes and affordable flights, and it's no surprise so many seniors choose to retire in the Sunshine State. Biggest cities offer a tradeoff - If you want next-day access to the most exotic destinations, you will probably have to live in the biggest cities. Los Angeles and New York rank in the top 25 because of their access to other airports, but outside the top 10 due to lack of affordability. Las Vegas is a destination for people the world over. While that can have a negative impact on the cost of living in the area, it does give local residents the chance to travel the world. This city ranks in the top 25 for annual international flights, annual domestic flights and the number of international destinations. Retirees living here also won’t spend a large chunk of their income on taxes. In both effective property tax rate and income tax rate, Las Vegas ranks in the top 10. Finally, when it comes to flying out of Vegas, securing affordable flight deals should be pretty straightforward. Las Vegas ranks third for the average cost of domestic flights. One of the most popular places in the country for moving retirees takes second. If you are a senior who plans on taking one or two trips per month, you will want to make sure you live somewhere with affordable tickets. Phoenix has you covered on that metric. According to our data, the average fare for a domestic flight out of Phoenix was only about $236 in 2017. No city offers more affordable travel to its residents. Phoenix also ranks in the top 25 for the number of available international and domestic flights, meaning you should have no trouble getting to where you want from Phoenix. If you’re a retiree looking for somewhere affordable, with low taxes and access to the wider world, look no further than Dallas. D-town ranks in the top 10 for both the number of available international flights and the number of available domestic flights. This city even ranks in the top 10 for the number of unique international destinations. Normally, to get that kind of access, you need to move to a more expensive city like Los Angeles or New York. But housing costs here won’t stop most retirees from having funds to travel. Dallas ranks in the top 20 for low median housing costs. One of the largest expenses anyone faces is housing costs. For seniors, especially, housing costs can become a burden. Houston ranks high on this list thanks to manageable housing costs. The median home in Houston costs under $1,000 per month, which is equal to about 29% of the average senior’s income. Living in Houston should not limit your traveling options, either. Houston ranks in the top 10 in all of our flight availability metrics. However, two problems may hold back travelers in Houston. Flights out of Houston rank on the expensive side, and Houston lacks travel agencies to help plan that dream trip. A second city in the Dallas metro area ranks in the top 10. Fort Worth shares much in common with Dallas, including an airport. That leaves residents in Fort Worth with good access to the wider world. Fort Worth also has the lowest senior poverty rate in the country, a sign that seniors in the city do fairly well. On top of that, Fort Worth also ranks 19th lowest for property crime rate. So you won’t have to worry about leaving your home unprotected as you venture to the four corners of the Earth. Chicago may not be many seniors' top choice when it comes to retirement. The winters are famously cold, and the city is on the expensive side. But Chicago has some of the largest airports in the country, so getting from cold Chicago to milder climates in Mexico or Spain is no problem. Another plus is Chicago has a fairly large number of travel agencies. That means seniors in Chicago who want help planning their dream trips across the world won’t have to look far. Retiring in Philadelphia and traveling the world shouldn’t be a problem. As far as big cities go, Philadelphia is affordable. According to our data, the median home costs about $941 per month. That is equal to about 26% of the average senior’s household income. With extra money saved on housing, seniors can afford to travel to more exotic destinations. One area where Philadelphia falls behind other cities is in ticket prices. Our data shows the average domestic fare for flights out of Philadelphia is just over $381, one of the highest rates for that metric in the study. Any city in Florida is a pretty good place to be if you’re a retiree. Florida is one of the tax-friendliest states in the country for retirees. Living in Tampa is also fairly affordable. For instance, the median home costs just under $1,100 per month. Tampa even has the fourth-lowest property crime rate in the study. This city falls to eighth in the rankings despite those high scores due to the lack of flight options. Tampa ranks outside the top-25 for its number annual international flights and annual domestic flights. There are many reasons to choose Fort Lauderdale as a place to retire. Low taxes and a low poverty rate for seniors are two that anyone can appreciate. But Fort Lauderdale is especially alluring for retirees who want to travel. Fort Lauderdale has one of the largest airports in Florida. Fort Lauderdale ranks in the top 25 for its annual domestic flights and annual international flights. Few cities offer residents more expertise in travel planning. Fort Lauderdale ranks fifth for travel agency density. Perhaps most appealing of all, Fort Lauderdale ranks second for the average cost of domestic flights. The capital of the Beehive State rounds out our list. Salt Lake City is affordable for seniors as shown by its low housing cost and low senior poverty rate. 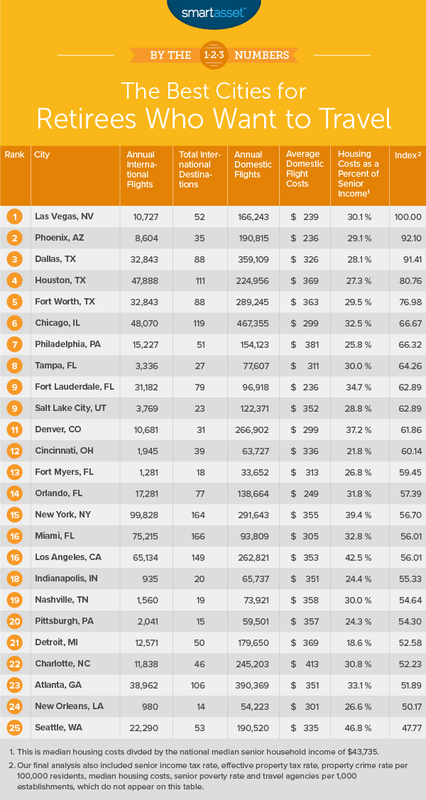 In both of those metrics, Salt Lake City takes a top-20 spot. Salt Lake City also ranks in the top 25 for the number of annual international flights. Where Salt Lake City is hurt is its income taxes. Utah is one of a few states that taxes Social Security income. Annual international flights. This is the total number of international departures made from each airport in 2017. Data comes from the Bureau of Transportation Statistics. Annual domestic flights. This is the total number of domestic departures made from each airport in 2017. Data comes from the Bureau of Transportation Statistics. Annual international destinations. This is the number of unique destinations each airport departed to in 2017. Data comes from the Bureau of Transportation Statistics. Cost of the average domestic flight. This is the average cost of a domestic flight for each city. Data comes from the Bureau of Transportation and is from 2017. Effective tax rate for seniors. This is the effective tax rate for a retiree with $15,000 from Social Security benefits, $10,000 from a private pension, $15,000 from retirement savings like a 401(k) or IRA and $10,000 in wages. Property crime rate per 100,000 residents. This is the number of property crimes per 100,000 residents. Data comes from the FBI and is for 2016. Median housing costs. This is the median housing costs. Data comes from the Census Bureau’s 2017 1-year American Community Survey. Housing costs as a percent of senior income. This is median housing costs in each city divided by the national income for senior households. The median senior household earns $43,735 according to Census Bureau estimates from 2017. Effective property tax rate. This is median property taxes divided by median home value. Data comes from the Census Bureau’s 2017 1-year American Community Survey. Senior poverty rate. Data comes from the Census Bureau’s 2017 1-year American Community Survey. Travel agency density. This is the number of travel agencies per 1,000 establishments. Data comes from the Census Bureau’s 2016 County Business Patterns Survey. First, we ranked each city in each metric. Then we found each city’s average ranking and gave a double weight to median housing costs, median housing costs as a percent of senior income and senior poverty rate. We gave a single weight to all other metrics. Using the city’s average ranking, we created our final score. The city with the best average ranking received a 100. The city with the worst average ranking received a 0. Save early - So you want to travel the world? A diversified investment plan, with money ear-marked for your golden years, can set you up for a comfortable retirement that will allow that, but starting your retirement saving habit early is huge leg-up in your overall strategy. By saving early, you give your money the chance to work for you through the power of compound interest. Tax-advantaged investments - After you have saved a bit, it’s a good idea to invest in the right kind of financial vehicles. For example, investing in your 401(k) or IRA will lower your tax exposure. By lowering your tax exposure, you can increase your savings rate. In turn, you can then reinvest those savings. Come retirement, you might be able to upgrade those hotel reservations. Don’t invest alone - As you're planning to see exotic parts of the world, the world of investments can be scary. There are so many things to consider. Your livelihood is at risk. So why not pass on the stress by getting an expert to handle your finances? A financial advisor can make sure you are invested in a way that suits your present and future needs. If you are not sure where to find a financial advisor, check out SmartAsset’s financial advisor matching tool. It will match you with up to three local financial advisors who can meet your investing needs.